SIZE & DURABLE POWDER COATED WELDED MATERIAL: Amagabeli metal flower pot caddy is 14 inch in diameter. This round iron planter stand is big enough to hold large and heavy planters or flower pot and moving around your home freely. The iron potted plant stand with wheels is made of rustproof and weather resistant powder coated metal material. Round flower pot rack on rollers is welded with high quality iron that makes this plant saucer with wheels can bear heavier plants pots or other planter. UPGRADED VERSION FIRM CONSTRUCTION & HEAVY DUTY: This upgraded plant coaster on wheels is modified according to customers’ reviews and feedback to the former version. The metal plant stand with wheels consists of 4 heavy duty wheels, which make this planter holder on wheels available to carry up to 300 pounds flower pot around your home. Now you can plant a tree inside your house with this plant stand with rollers! INDOOR USE FLOOR PROTECTING & DECOR: This floor flower pot rack is with smooth wheels, no more worry that your expensive floor may be worn out. The plant rolling caddy with aesthetic design adds a stylish and nature touch to your home. The circular arc iron with fine black coating makes this plant roller with casters itself a decorative element that fits any house design and add more delights to your life. Plant container stand with wheels is of an architectural structure that is stable. OUTDOOR USE RUSTPROOF & NON-STUCK ON CARPET: This heavy duty patio plant caddy with wheels is made of black iron with vinyl pvc powder coated surface will enable you to use the garden plant caster with wheels outdoors durably. The rolling plant stand with black fine surface will nicely compliment your patio, garden, yard or deck. 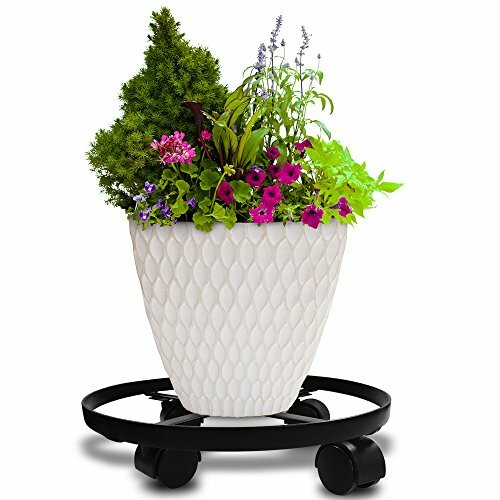 Plant dolly or plant tray with wheels can be freely moved on house floor, even on the carpet, soil ground and lawn, and the wheels do not get stuck or locked up. 90-DAYS WARRANTY: This corner plant stand indoor, floor plant saucer with wheels can be widely used indoor and outdoor for moving garden pots, heavy plants, large potted trees, large vases, whiskey barrels, or heavy trash cans and can protect your floor from being worn out. Replacement for Amagabeli plant rolling stand, or repaired parts for Amagabeli plant rolling tray shall be covered within the Limited Warranty Period. NOTE: Pots for demonstration purpose only, not included. UPGRADED VERSION FIRM CONSTRUCTION & HEAVY DUTY: This upgraded plant coaster on wheels is modified according to customers' reviews and feedback to the former version. The metal plant stand with wheels consists of 4 heavy duty wheels, which make this planter holder on wheels available to carry up to 300 pounds flower pot around your home. Now you can plant a tree inside your house with this plant stand with rollers!